So Lonely in Gorgeous: Two's Company, But Three Is Just So Stunning! THREE Cosmetics Flash Performance Eyeliner Pencil swatches. Two's Company, But Three Is Just So Stunning! 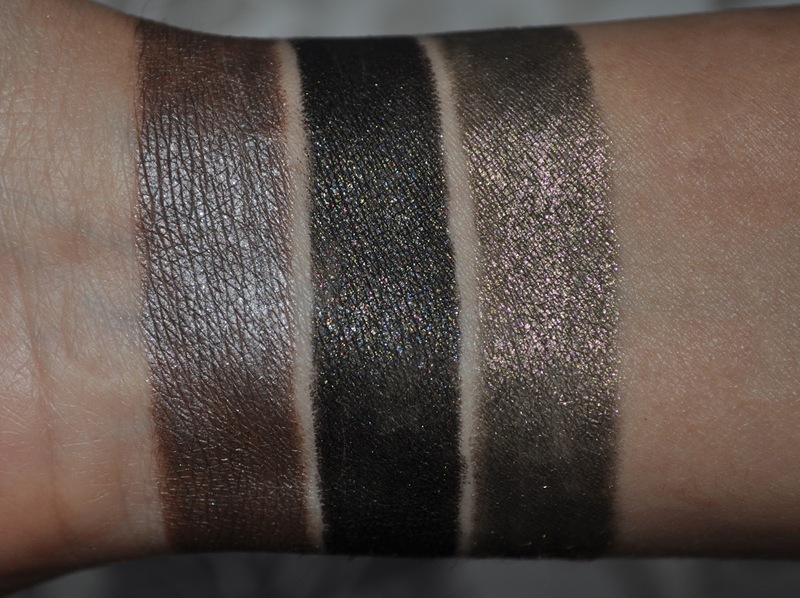 THREE Cosmetics Flash Performance Eyeliner Pencil swatches. 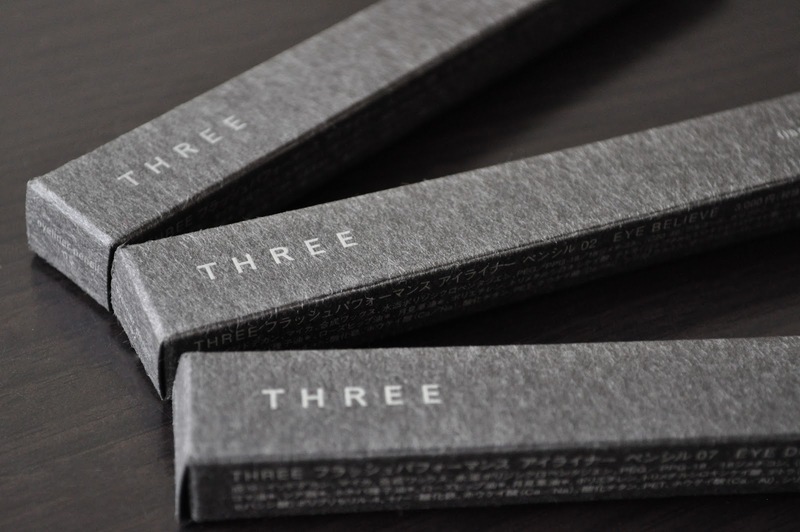 THREE is a relatively new Japanese cosmetics brand (I believe three launched in 2009), whose creative director is the innovative makeup artist extraordinaire, Rie Omoto. The company's name is based on its three fundamental values: natural, honest and creative. On April 10th, THREE released three new shades of the Flash Performance Eyeliner Pencils: 06 Eye Kon, 07 Eye Doll, and 08 Eye On. I Purchased 07 Eye Doll and after some internal debating, I'm going back for 06 and 08 :P Also, I picked up 02 Eye Believe and 05 Eye Rock. 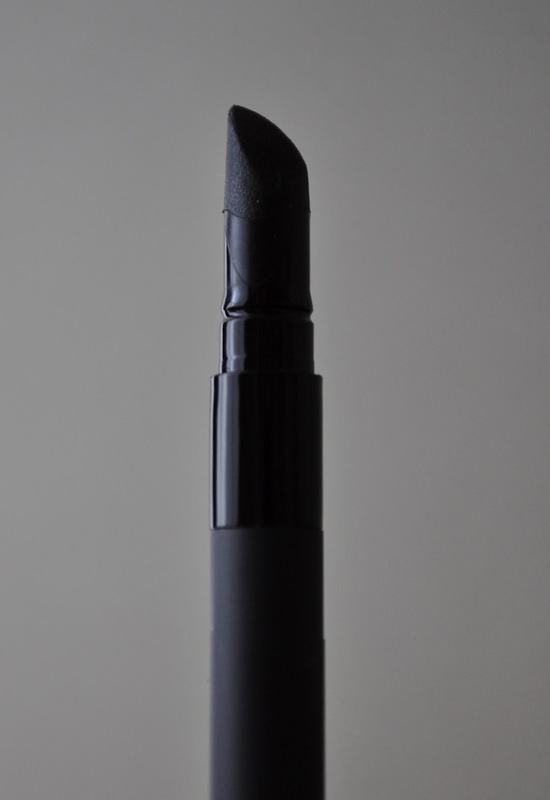 The rubber tip smudger blends the product out beautifully, never tugging nor dragging on the skin. Also, I was pleased that the smudger was made of rubber because it's ideal for sanitation purposes. 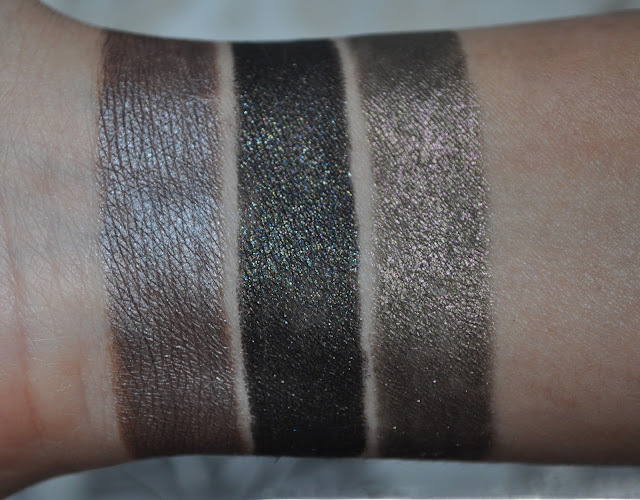 From left to right: 02 Eye Believe, 05 Eye Rock, 07 Eye Doll (natural lighting). 02 Eye Believe: A lavender taupe with a hint of mauve and micro silver flecks. 05 Eye Rock: A burnished black with micro gold, blue, red and green flecks. 07 Eye Doll: A tarnished olive khaki with micro gold and pink flecks. From left to right: 02 Eye Believe, 05 Eye Rock, 07 Eye Doll (flash). I've been using these liners for a month now and I absolutely adore them! The Flash Performance Eyeliner Pencils are extremely soft and creamy; allowing them to blend out easily or to create a sultry smoked out look. Plus, these lovely liners are incredibly pigmented and, once applied, they won't budge. Although not marketed as waterproof, the Flash Performance Eyeliners didn't fade or disappear when they came into direct contact with water. Currently, THREE is exclusively sold in Japan and can be found at the following counters located in Tokyo: Mitsukoshi (Ginza), Isetan (Shinjuku), Seibu (ikedukuro), Seibu (shibuya) and Hikarie (Shibuya) The Flash Performance Eyeliner Pencils retail for 3,150 yen ($39.48). They are AMAZING! If you like, I can get them for you :D Pardon my ignorance, but are you in Japan or the UK? Yeah, I remember the days when I used to live out of a suitcase (cases to be exact :P). I'll definitely keep that in mind love :D Please let me know if you want anything. These are all amazing, and I love the fact that the micro flecks actually show on the eyes. Nice colours! They must look great on you. do you want anything from HK? Let me bring you some!!! When will you be in Tokyo? Aki and I are planning a little vacation in June for his birthday, so I need to make sure I'll be here when you come. By the way, I got your email and I'll reply this week...GOMEN for the delay!!! I found this blog from Drivol about Frivol and... WANT. I have never wanted a pencil eyeliner so badly! Have you tried their eyeshadows? I feel like if I'm going to beg for a CP it should be for more than an eyeliner (or two or three). Pardon my ignorance...but what does "CP" mean? I think she means "custom purchase"
Jacq, if you want something, just let me know! Do you have twitter? I'd love to chat with you more! Your swatches are amazing! I'll definitely need to check out these eyeliners when I visit Tokyo in the fall. Wow, I have to try these eyeliners out; I have the oiliest lids ever and pencils don't normally work on me. I highly recommend these Kuri!! OMG, these are lovely! I hope I can find these when I am over in HK and Taiwan! Hi these look amazing! I have been searching for it online but can't find any outside Japan. Do you happen to do shipping to Australia? Do let me know, thanks! I'm not sure what the shipping would be off the top of my head, I'd have to go to the post office. Could you give me your city/state/country/postal code? hi, would you help ship to Singapore too please? been looking all over for these!!! Hi, would you be able to help purchase this for me too please? Which email address can I email you at? Thanks so much! 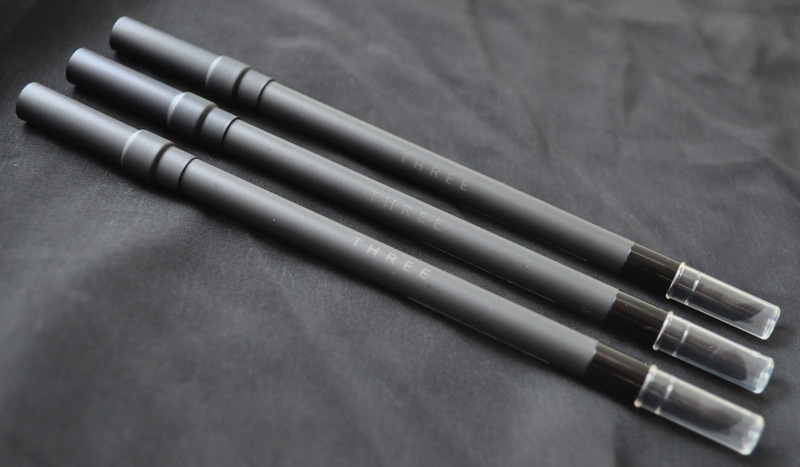 THREE is one of my favorite Japanese cosmetic brands, and these liners are divine Elise! Hey there, just one question - do you use just a normal sharpener for the eyeliner? Besides the THREE sharpeners, I found the ysl sharpener works best with these liners. Two Awards, A Blog Hop and some Pocky! 20% Off All Too Faced Lipsticks! I Have The Best Clients! Tasty Sweet Gifts From Kyoto!